Elaine Moore from Vancouver, WA. sent me some stamped Thomas Kincaid images recently. I picked out this one to work into a Father's Day card. It was a little intimidating, but I dove in and, using various mediums (chalk mostly) I finally finished this one. I really like the way the chalks translate into muted colors on the card. I used a white gel pen for some of the highlighting. The sentiment is from Stampin' Up's When I Grow Up set. 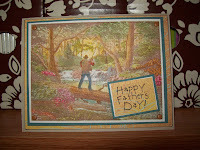 I think I'll probably give card to the husband of one of my dear friends as he is an avid outdoorsman. WOW! That is awesome! Great job. You did a FABULOUS job on this Mom!!! It's turned out great!